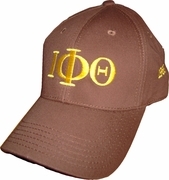 This twill cap is simple and attractive. Greek letters embroidered on the front and "1963" embroidered above the left temple. These structured caps feature a Velcro closure for an adjustable fit.